Bike Turnouts have the potential to significantly reduce the number of collisions, serious injuries and possible fatalities! 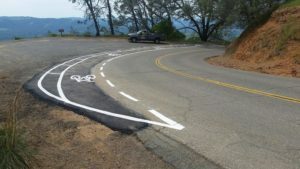 Mount Diablo State Park (MDSP) and Mount Diablo Cyclists worked together from 2016-2017 to design and install three Bike Turnouts as a pilot study. Bike Turnouts allow a cyclist pedaling uphill to move slightly to the right, thereby allowing a motorist to pass safely, that is, without crossing into the downhill lane, and possibly colliding with a descending cyclist. Bike Turnouts have the potential to significantly reduce Bike vs. Vehicle Collisions, especially on blind curves. The majority of collisions occur on or near blind curves! They are typically only 100-150 feet in length, and relatively inexpensive to construct. Comments from motorists and cyclists were very favorable; motorists do not have to cross the centerline into the wrong lane to pass a cyclist, and cyclists do not need to pull off the road onto the dirt and gravel in order to allow a driver to pass. Following review of these positive experiences, 10 additional Bike Turnouts were installed in February, 2018. These required only painting. Anecdotes and surveys from drivers and cyclists alike, and video images taken at these turnouts all support the increase in enjoyment and safety already experienced by many with the advent of the Bike Turnouts. Park leadership has concurred with Mount Diablo Cyclists that a total of 60-70 Bike Turnouts on the 18 miles of roadway on Mount Diablo is optimal. This would substantially decrease the amount of time that a motorist would need to wait to safely overtake a slow, uphill-bound cyclist. Designing and constructing the additional Bike Turnouts will require substantial effort and funding. However, we believe that the ultimate goal of preventing bicycle vs. vehicle collisions, and the potentially fatal consequences thereof, more than justifies the investment. In January 2018, Park leadership agreed to request an additional 64 Bike Turnouts and to submit the Project Evaluation Form (PEF) to Sacramento by March 31, 2018. At this time, these additional 64 Bike Turnouts have not been approved or funded. However, with your support, we believe that the first 10 of these additional 64 Bike Turnouts can be approved, funded and installed in 2018.